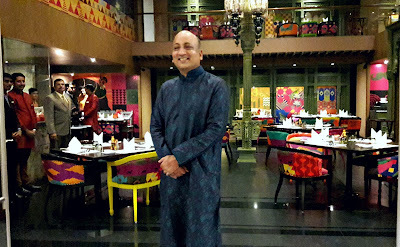 Hamsa, the fine dining vegetarian restaurant at Adyar is now the setting for a high tea experience. Subdued lighting and the cool interiors of the restaurant make a hot cup of tea (or coffee) and a bite (or three) a very welcome proposition. The concept of high tea brings to mind the English setting of a tea room - chintz curtains, delicate China teapots, cups and saucers, tiered stands holding scones, clotted cream and jam, wafer thin cucumber sandwiches, dainty cakes and tarts to nibble on amid murmured conversations. However at Hamsa, they like to do things a little differently. 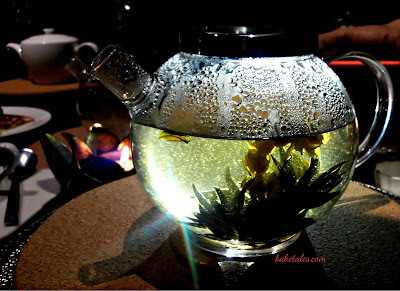 A group of us bloggers were invited to review the High Tea. We were warmly welcomed by the owner, Nithin Kalkiraju before being led to our seats. On another table, platters of the High Tea specials were being arranged, social media experts and Instagrammers were busy clicking pictures of black platters that held vadais, cutlets and other snacks along with accompanying dips. 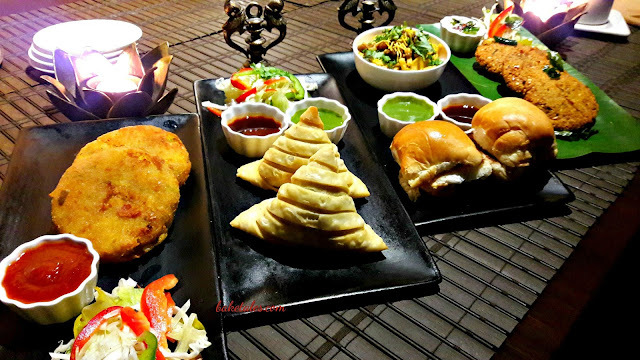 The spread; from masala vadais to biryani arancini and everything in between! Standing beside the display was not helping anyone. Beautiful aromas wafted around the room, all of us had skipped lunch in anticipation of a heavy teatime experience. 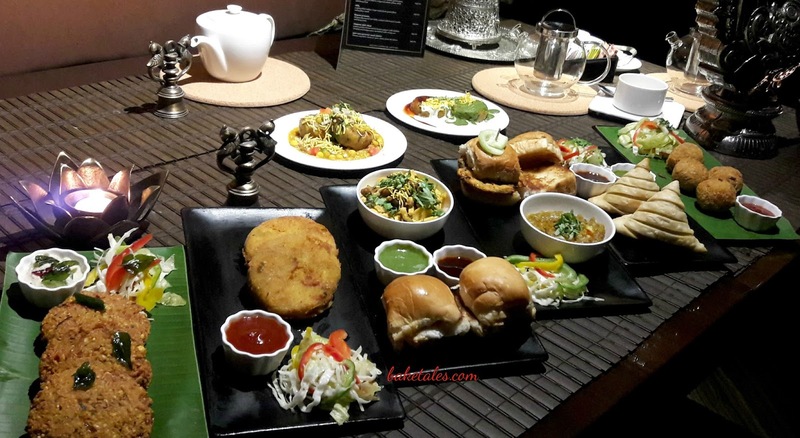 Soon, the table was filled with the most vivid colours and 8 delicious treats. Each platter represented a full portion of the snack. Tasting portions. The first bite of the biryani arancini was promising. 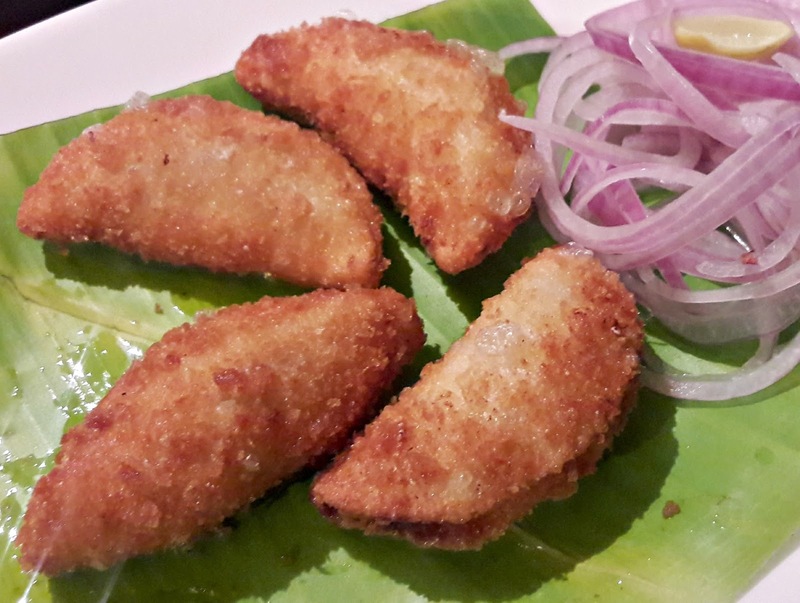 Beautifully crisp shell, full flavoured biryani and a heart of melting cheese. 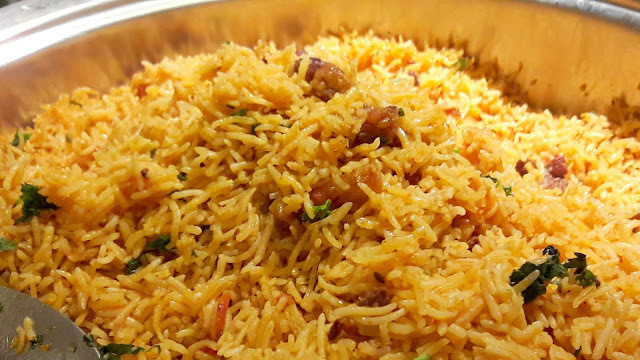 But with the second bite, the flavour of rice was overpowering and the flavours were not balanced. After clicking to our hearts' content, we were served tasting portions. How pretty the miniature versions looked. 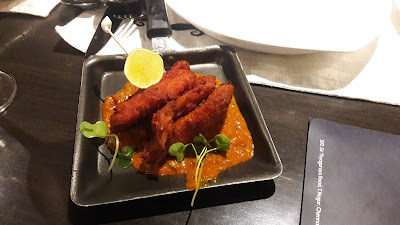 The paneer aloo cutlet was very soft and I guess the chefs would have had a difficult time shaping them. 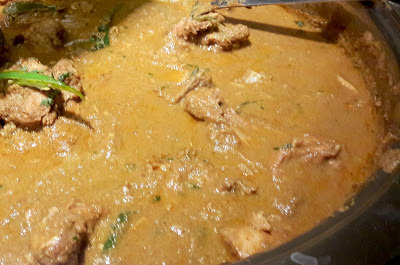 Neither main ingredient could be tasted and although it had been fried, no trace of oil remained. 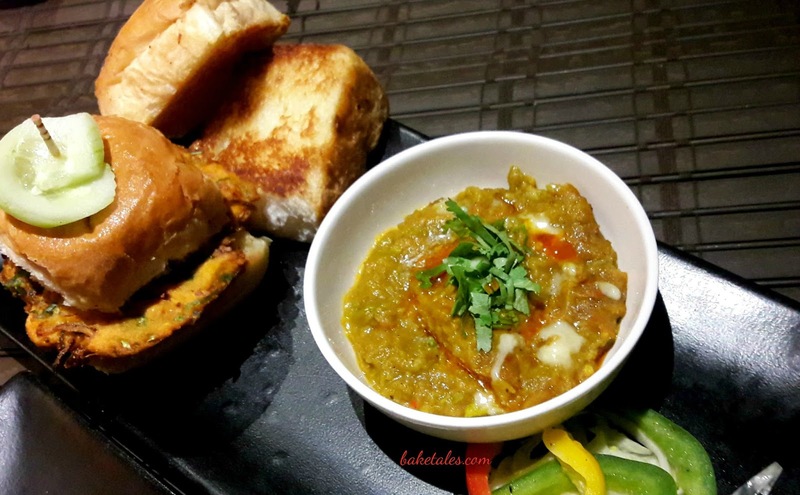 The misal pav was tangy and tasty, the buns were deliciously soft. 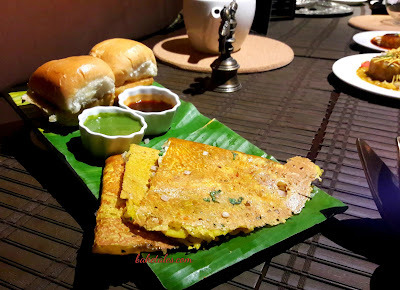 Khanda bhajji & pav. The onion fritter in the pav was a bit of a letdown. The laccha samosa had a yummy filling of mashed potatoes, onion and peas but the deep-fried crisp pastry stole the show and I can only imagine the hard work that would have gone into shaping it. 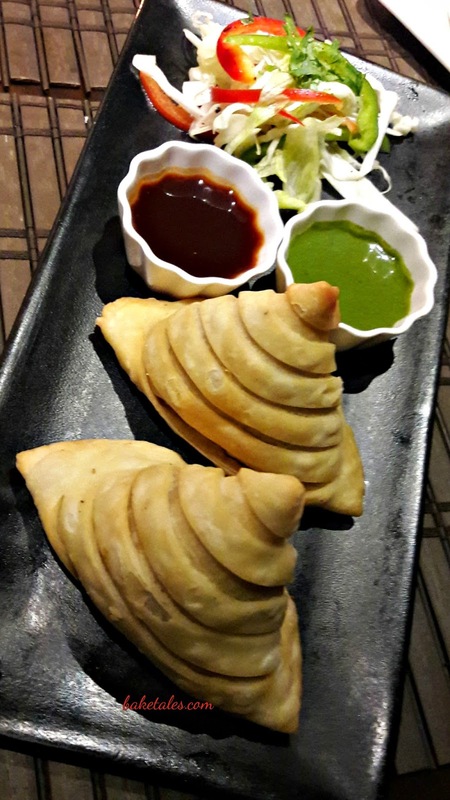 I loved the look of the samosa in this avatar. 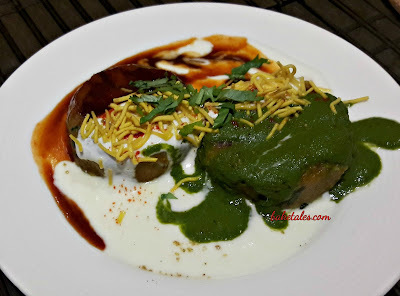 Both ragada pattice with white peas and chatpata dahi chaat were delicious. 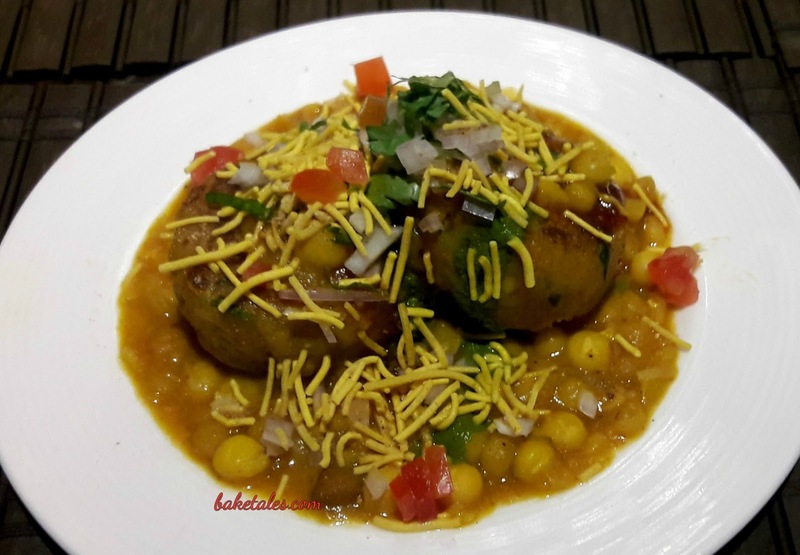 But then, I'm partial to a well made chaat! Chila stuffed with cheese, onions and coriander. Made of chickpea & lentil flour, one of these at breakfast should keep you going through the day!! 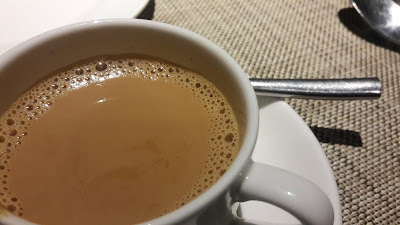 There is a choice of beverages but with our tasting menu, masala tea and filter kaapi were offered. Of the two, I preferred the coffee and would have liked it even more if the milk had been served separately. They also have blooming tea, floral infusions and beverages. 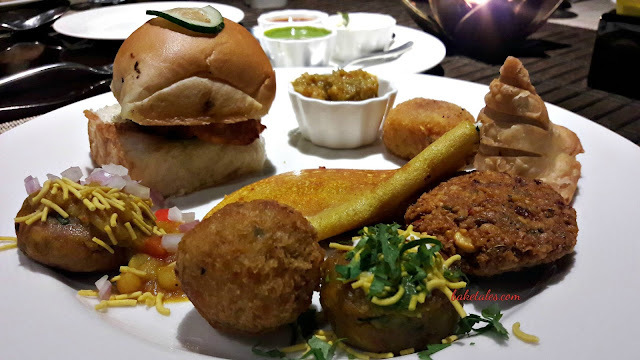 The high tea menu has an interesting mix of North and South Indian snacks and some fusion. However, it does tend to be quite filling as many of the base ingredients are potato and lentil-based. Each platter is priced at 195/++ or you could order a personal snack platter priced at 395/++ and choose from any 3 platters on the menu. That's a fantastic option if you've missed lunch or intend to miss dinner. 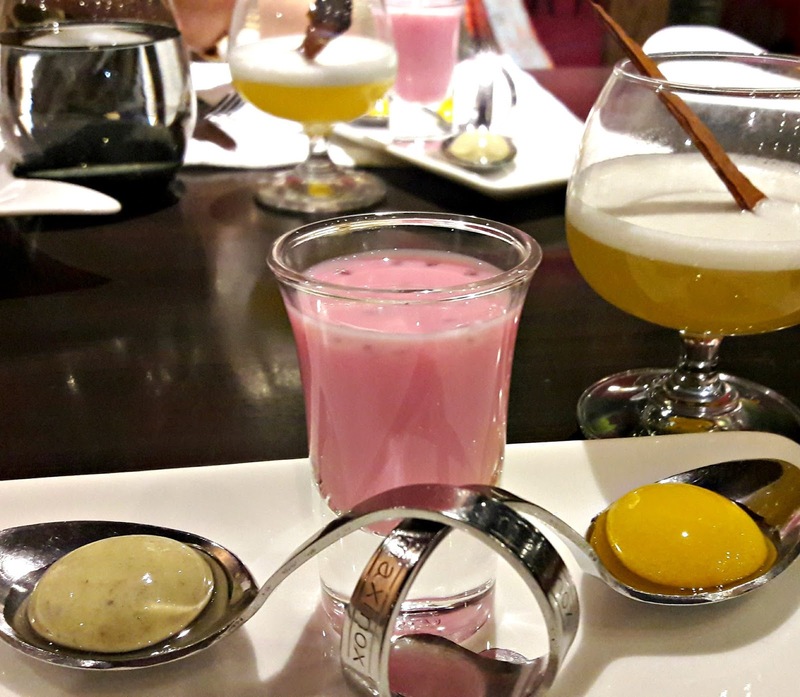 Hamsa's High Tea is only on weekdays, from 4 - 6 pm. 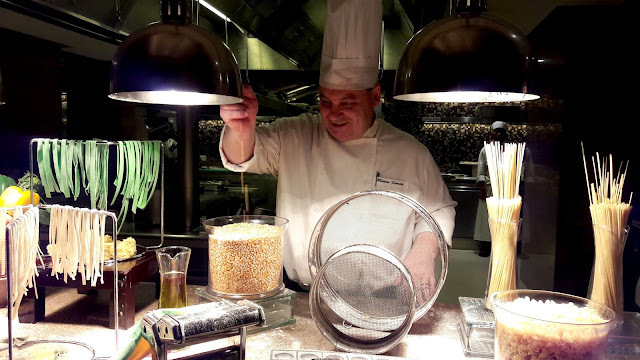 The red curtains were drawn back, candles lit the room and the hero, Chef Mauro Ferrari aka the Drama Chef stood at his station in the open kitchen. Surrounding him were his sous chefs. 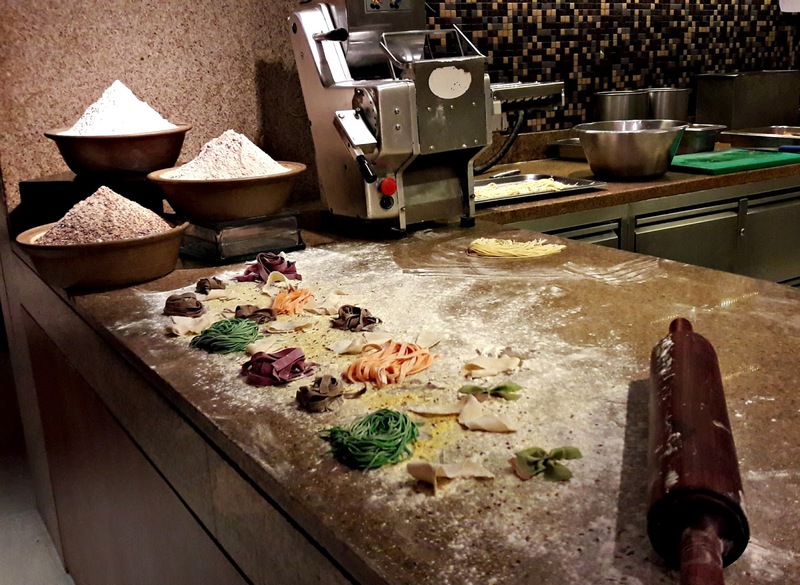 The Drama Chef opened last Friday at Focaccia, HRC and a group of us were invited to review the theatrics of a pasta production. On the counters lay the props - mounds of flour, eggs and vegetable pastes. The jars were filled with pasta shapes, pasta making equipment like moulds lay around and strands of pasta were hung to dry. Chef Mauro was plating up his creations as we walked in. Each one of the appetisers was dramatic in presentation and like a good story, the story begins to reveal itself when you are well and truly immersed in the dish. Like the first appetiser, tomato jelly, cherry mozzarella in carrozza. 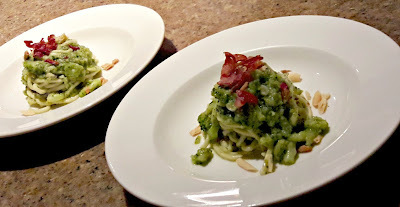 Pesto was painted on the plate and on it sat a thin disc of tomato jelly. Crumb-fried bocconcini cheese balls and basil leaves completed the dish. Why did it all look and taste so familiar? Then realisation - such a clever take on insalata caprese. Bravissimo! 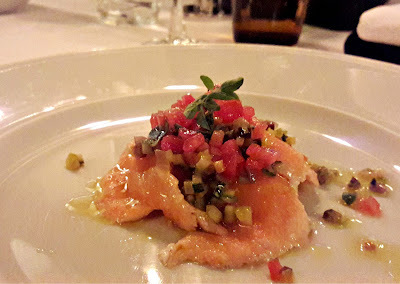 Warm fresh salmon mille-feuille, black olive pate, micro ratatouille was the second appetiser. It was a good plot for we discovered a deliciously flaky round of pastry smeared with dark olive pate under the thinnest slices of salmon. The micro ratatouille scattered over the top blended in seamlessly and provided textural contrast. Wild mushroom and truffle oil gougerès was the last of the appetisers but the touch of whimsy and humour was evident in the presentation - the little choux buns were arranged according to size. 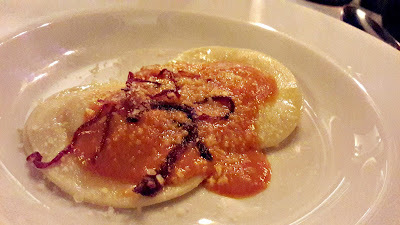 The flavours of earthy porcini that blended perfectly with the savoury Parmesan and truffle-infused oil were superb. The pink soup was a watermelon and cucumber gazpacho. Smoked diced prawns and a single nasturtium decorated it. Light and delicious and perfect for a hot summer night. We got to watch how square spaghetti, the first of our mains was made. 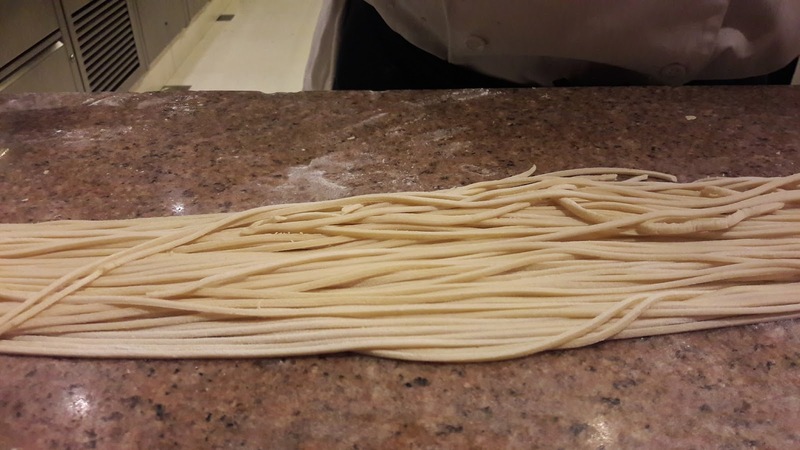 As the pasta was rolled out, we touched it to feel its silky smoothness. Later, it was cooked and a broccoli paste (probably the minor villain) was tossed through it. Topped with shards of grissini, the speck that was crumbled over the top saved the day! There are about 350 kinds of pasta in the world, among them ravioli and tortellini. 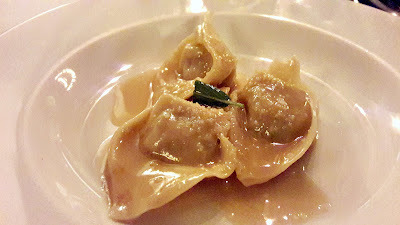 The ones that were served to us were exquisite, especially the lamb stew tortellini with butter sage. The lamb had been slow cooked for 12 hours, intensifying every flavour. We also learnt a new one - casoncelli and there and then, fell in love with it. It was not called exotic for nothing for it was filled with a paste of prawns, sauteed vegetables and a hint of ginger. 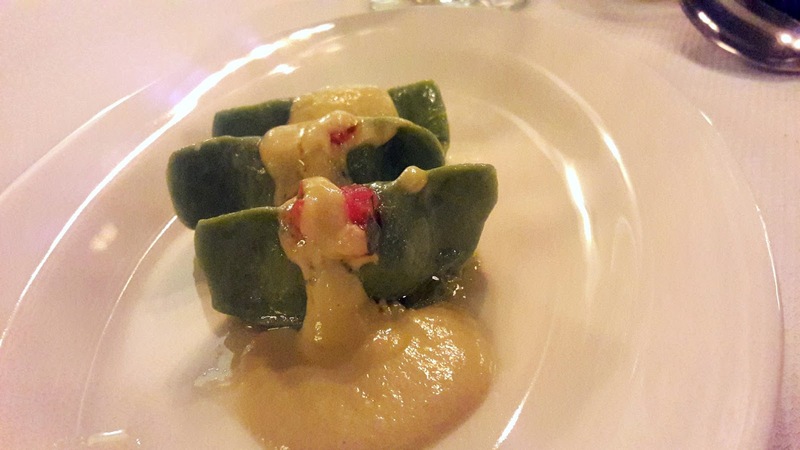 Piped into fresh spinach pasta, it was cooked and served with a leek and bisque foam. The colours! The taste! Chef Mauro also showed us how to make this variety of stuffed pasta. His fingers flew over the little discs and in no time, they had been shaped and were ready to be cooked to al dente perfection. The dessert we were served was a one night only show. 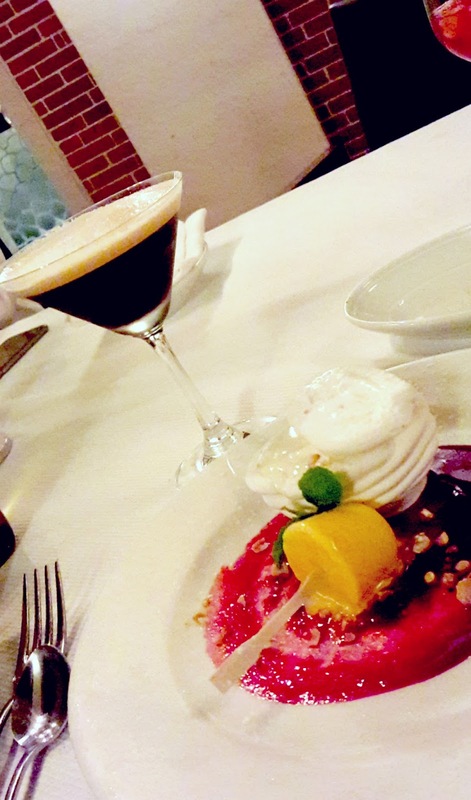 Chef Mauro had pulled out all the stops to present his white gianduja parfait meringue with raspberry coulis, frozen mango and rum smoothie. The crisp meringue shell had been filled with gianduja parfait. 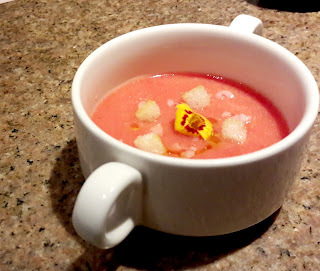 The slight acidity from the raspberry coulis and mango smoothie toned down the sweetness but it was the construction that left us awestruck, one that deserved a standing ovation! Our preview dinner of 3 appetisers, a soup, 4 mains and dessert was priced at 2500/++ and was available only that night. Do not despair as The Drama Chef will be presenting his specialities till July 30th. You can be a part of the drama by choosing the pasta of your choice, the filling and the sauce. Or you could do the job yourself if you like. A la carte prices start at 800/++, unlimited pastas at 1300++. Whichever you opt for, do remember that if you ever want pasta this delicious, you can either have it at Focaccia or go to Italy. The closest I got to Goa was booking 2 tickets to fly there and then having to cancel. Yeah, life is like that sometimes. 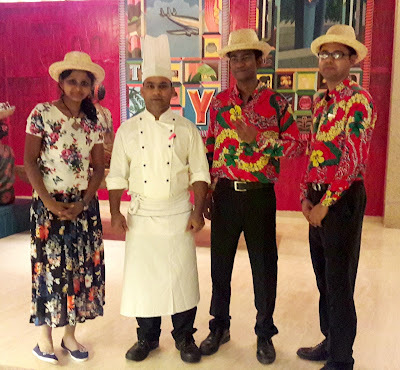 Still, we have to look at the positives, like when Chef Vithal Naik of Grand Hyatt Goa came to Chennai with a bagful of Goan ingredients to convert Spice Haat into "A Goan State of Mind". The restaurant was decked up as a mini Goa with stalls by RASA, an NGO, selling imitation jewellery and clothes (they have some really nice ones with embroidery). Lively Goan music and the colourful clothes worn by the service crew added to the carnival- like atmosphere. 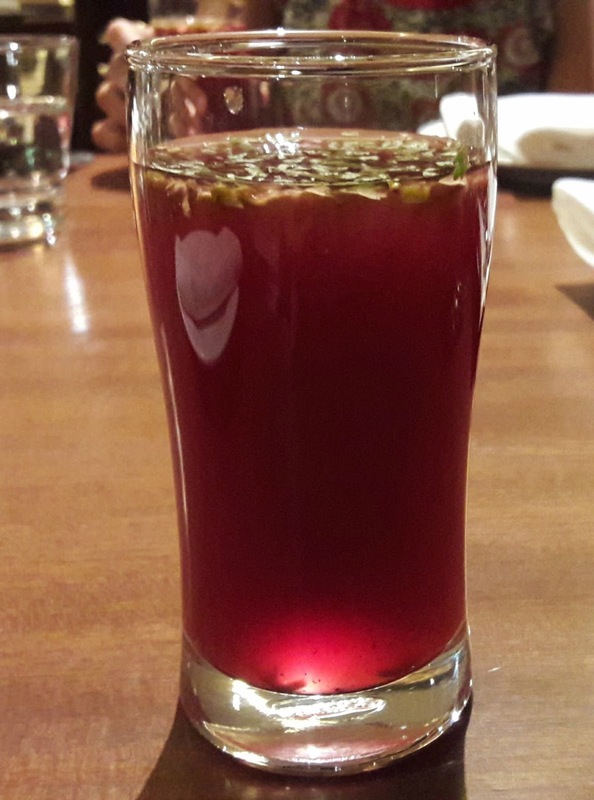 I was invited to review the festival and the welcome drink, plum-coloured kokum juice was served first. 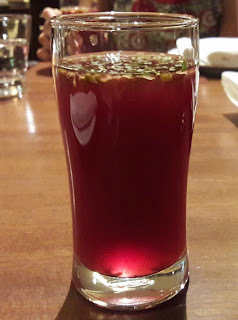 It has a peculiar sweet and sour taste and is not unpleasant. It is a non-alcoholic digestif with a host of health benefits so don't forget to drink up! Looking for the appetisers? They're right up front as you walk into the restaurant. 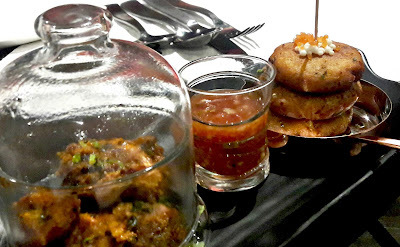 The ros omelette, an omelette cooked with diced tomatoes, onions and herbs is topped with a little chicken gravy. 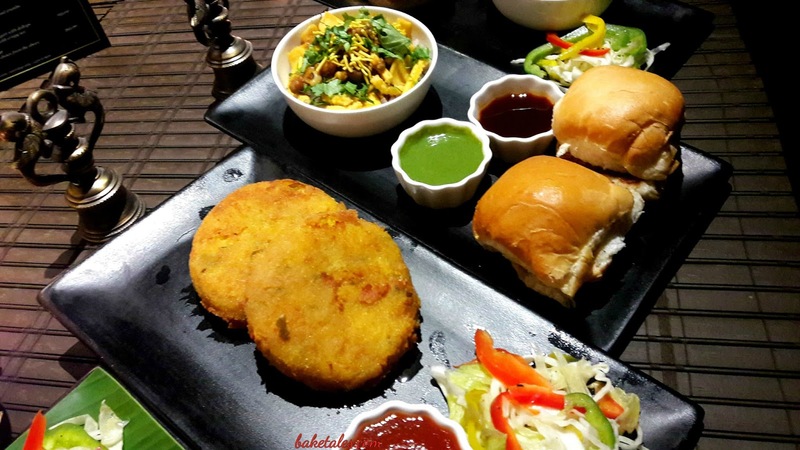 The veg cutlet pav, served with tartar sauce was the one I liked more - the cutlet was coated with rawa and was super crunchy. 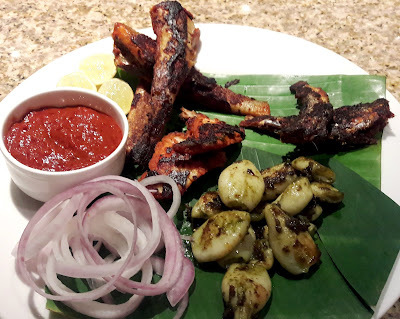 At the grilled fish counter, platters held marinated ladyfish, sardines, basa and squid rings. All that seafood is very fresh and served with an absolutely delicious peri peri paste - wait, not peri peri but Kashmiri chilli paste. 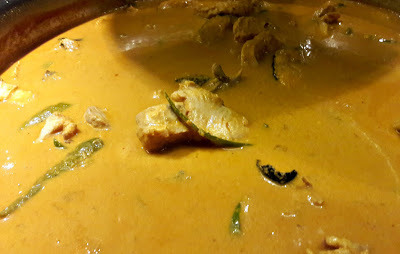 Still, it was red, zesty and gave off this lovely warmth and went well not only with the grilled seafood but everything else, including the pulao! Back at the table, the prawn rissois were waiting - deep fried half moons of dough filled with a delicious chopped prawn mix. 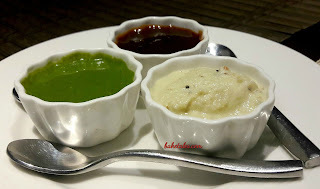 And the chilli paste is the perfect dip; if you find that too spicy, tone it down with some of the tartar sauce. You can try to eat the grilled fish with cutlery but my advice is to just do the job with your fingers. Main courses were arranged on the buffet counters. 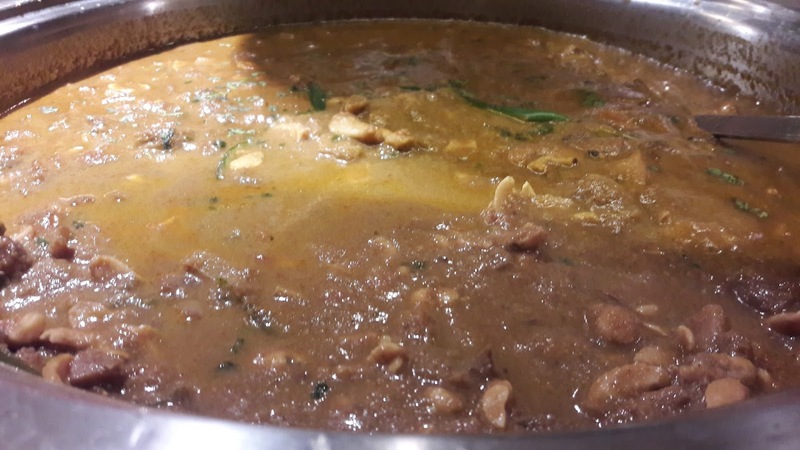 Everyone has a favourite way of cooking the ever-popular chicken xacuti and Chef Vittal's version, thickened with coconut paste and redolent with the aroma of spices was tasty. The vegetarian dishes were all delicious, especially suran caldeen - raw banana cubes cooked in coconut paste (could have had a whole bowl of it), vegetable khatkhate - vegetables cooked in Goan spices and mooli ki bhaji - slices of radish cooked with coconut. 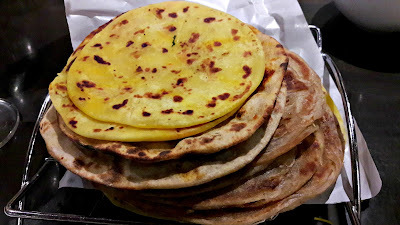 All these are served with rice though I did wish there were sannas to mop up the gravies with. The highlight was definitely the chorizo pulao. 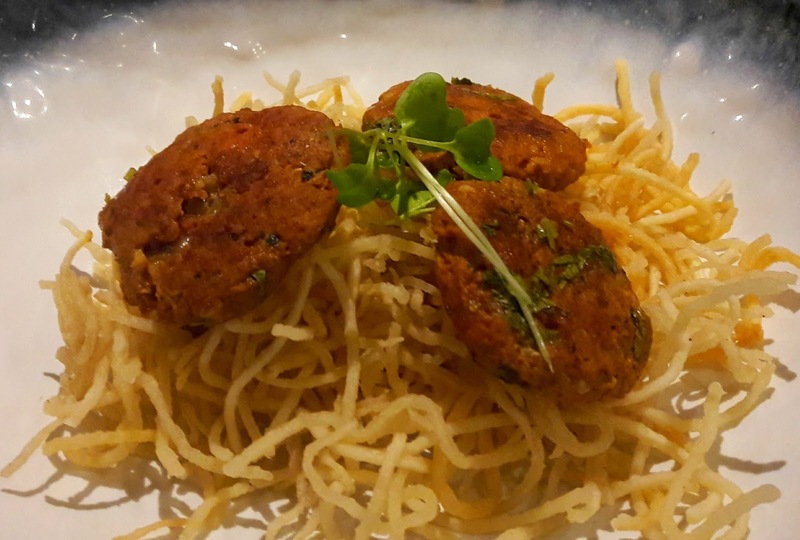 Long, yellow grains of rice glistened in their coat of oil interspersed with chunks of the meat and the green of coriander leaves. The slightly smoky aroma of the chorizo was so alluring and it tasted fabulous. 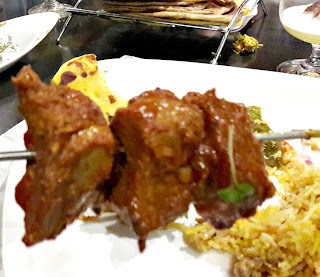 I've never had Goan sausage cooked in a pulao and this was quite a discovery. 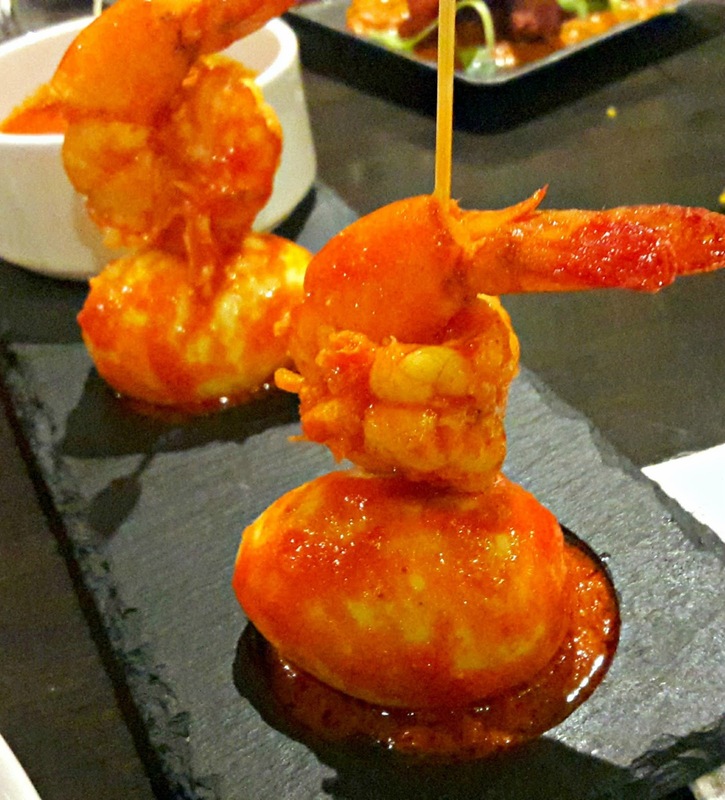 The perfect accompaniment was of course the prawn pickles. 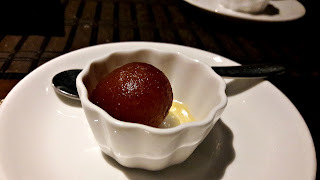 There are plenty of desserts to choose from and if, like me, you're only interested in the Goan ones, there's bibinca, doce and dodol. The bibinca and dodol are delish and worth keeping some space in the tummy for them. Goan State of Mind is on till July 23rd, 2017 and is priced at 1450/++ per head. There was an encounter that night. The flash of metal (spoons), blowtorches shot out flames and there was smoke - err - mist everywhere. Casualties? Of course, most folk would have gained a little weight by the time it was all over. The encounter, of course, was of a culinary kind. Amir Mahal is the home of the Nawab of Arcot. The palace is about 150 years old and at its heart, as with any home, is the kitchen. Generations of cooks have worked in the kitchens of Amir Mahal, following time-honoured recipes and methods of cooking and over the years, fine-tuned many of them and even created several of their own. 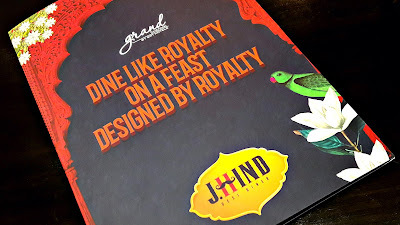 Jugalbandi Hindusthani, J.Hind for short, the avant-guard restaurant at Grand by GRT Hotels has chefs who apply modern cooking methods like sous-vide and spherification to the food they cook. 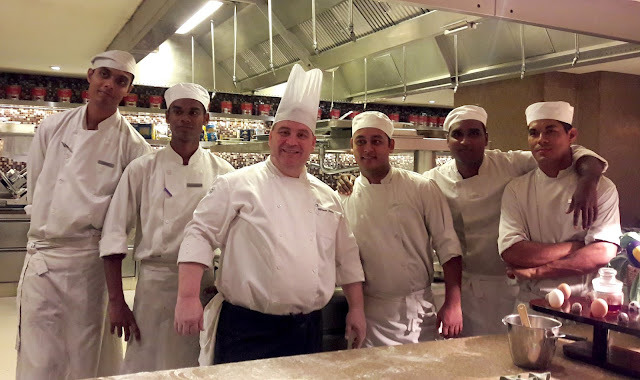 These two worlds met head-on recently when chefs from the hotel went to the palace kitchens to learn the secrets of Arcot cuisine. 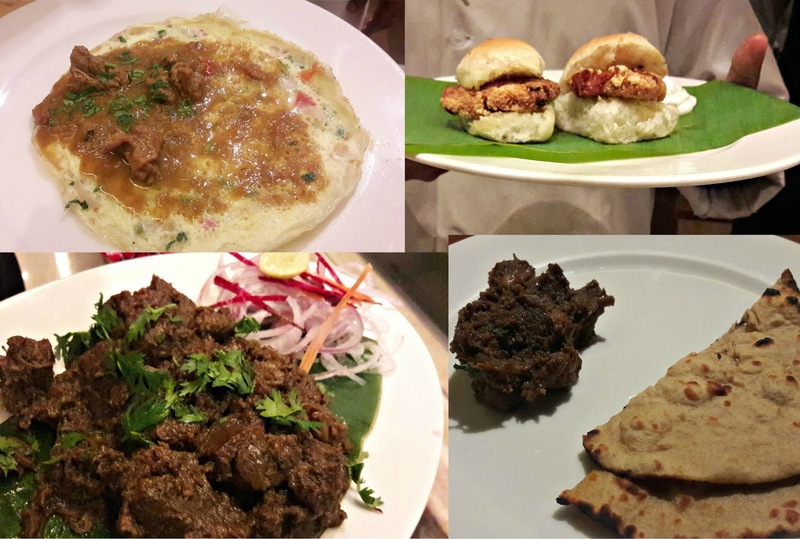 During their time at the palace, the chefs learnt treasured recipes and culinary techniques that kept the nawabs contented. When they came back to the hotel kitchens, they didn't just do a copy-paste job. 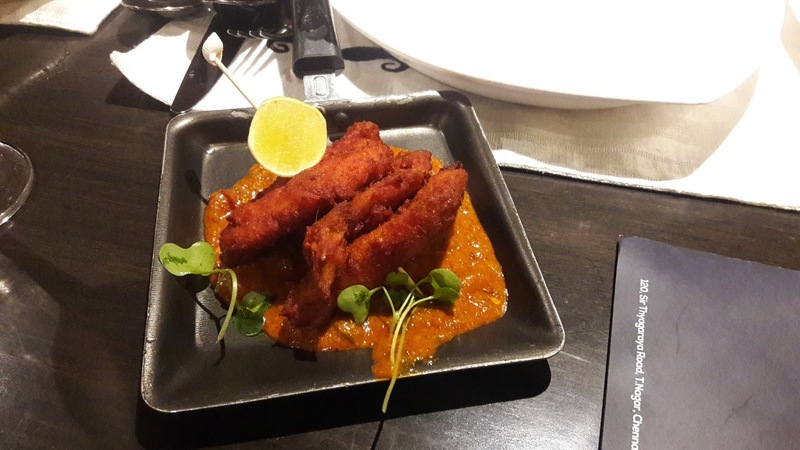 Instead, home-style recipes were given a molecular twist and that was how we got to experience Royal Repast, a culinary jugalbandi of heritage recipes cooked with some molecular gastronomy. 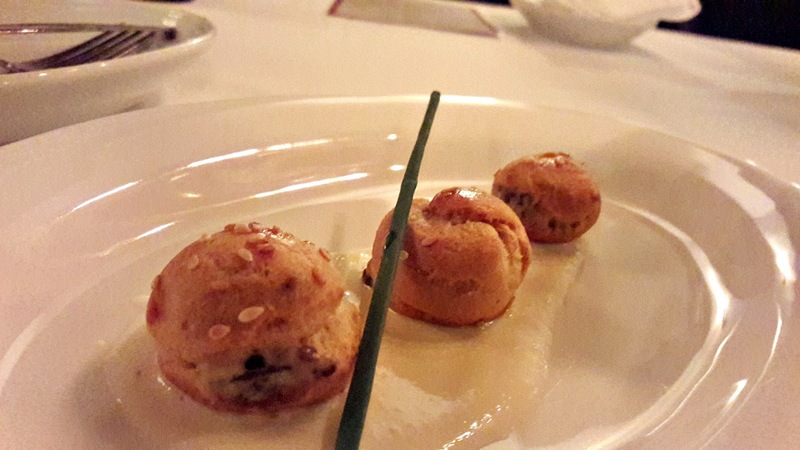 We were invited to preview the 12-course degustation menu that was quite the talking point throughout the meal. 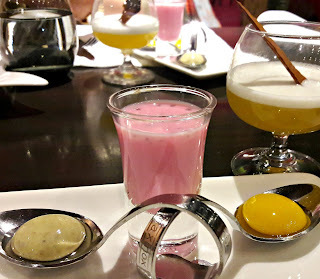 I just love anything rose-flavoured and the subza (basil seed) rose milk was perfect in terms of taste and temperature. The amuse-bouche - dry nut and apricot spheres were perfectly formed and tasted nice. Time for soup and we had little muslin bags in our cups. 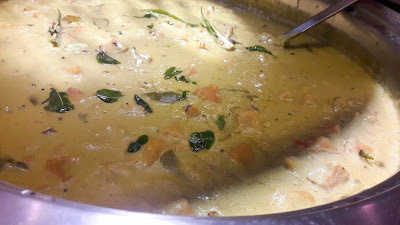 The soup, a tender coconut broth was poured over, releasing the flavours of roasted garlic, ginger and cumin from the bag. Did I say it was flavoursome? Delicious? Comforting? Mellow, light and coconutty? All that and then some more. 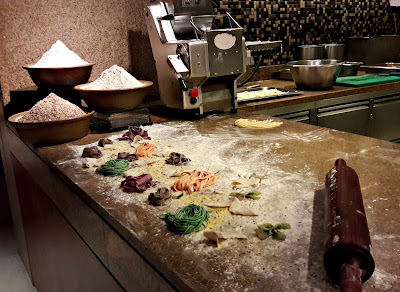 The chaat trolley trundled up and we got to watch the creation of focaccia shermal with a little nitrogen fix. Quite an unlikely combination but it was one that worked. Nothing like a tangy spicy chaat to whet the appetite. Flaming fish tikkas, super-tender chicken tikkas finished with a lick of flames from a blow torch were all very interesting till the anda jhinga tamatar was placed in front of us. What a combination of hard boiled egg with a jumbo prawn; the sauce was absolutely yummy. A stack of Indian breads - wheat, sundried tomato and ulta tawa parathas were served to mop up delicious gravies. The one dish that we all awaited, Arcot gosht biryani was presented in a glass jar - nice touch of whimsy there! 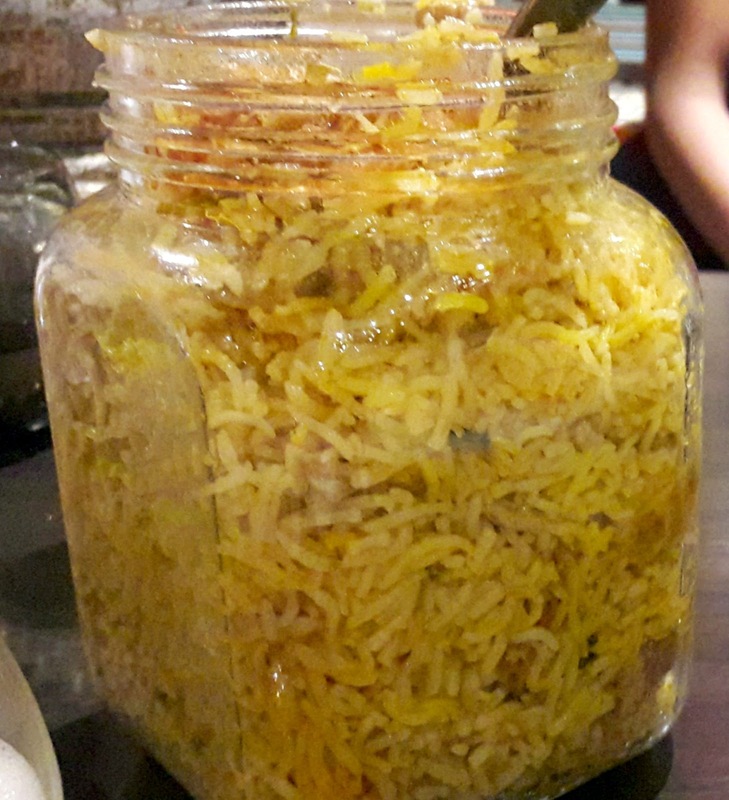 The mildly spiced, smoked, aromatic rice was a pale yellow and cooked to long grained perfection. Each grain was separate and flavoured with the lamb juices it was cooked in. Definitely worth the wait. Of the desserts, the soft and creamy jackfruit ice cream stirred in with some liquid nitrogen stole the show. As a finishing touch, ruby red frozen rose petals were sprinkled over. 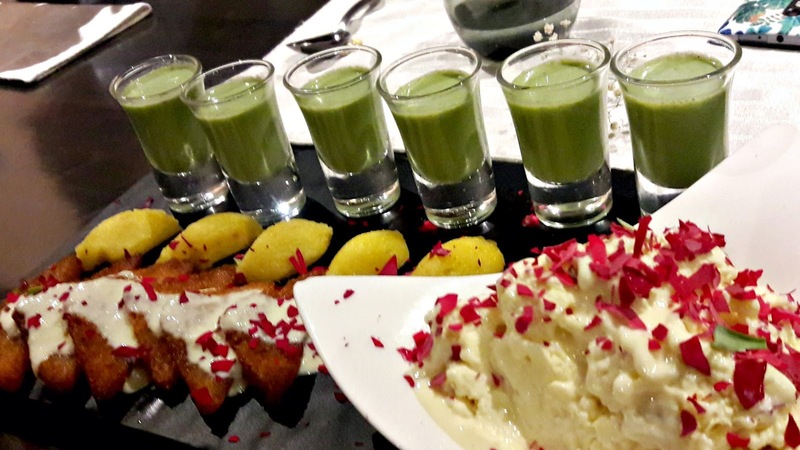 And that paan shooter, it's yummy. Royal Repast, the Nawabi degustation menu at J.Hind, will be served for lunch and dinner till the end of July 2017. 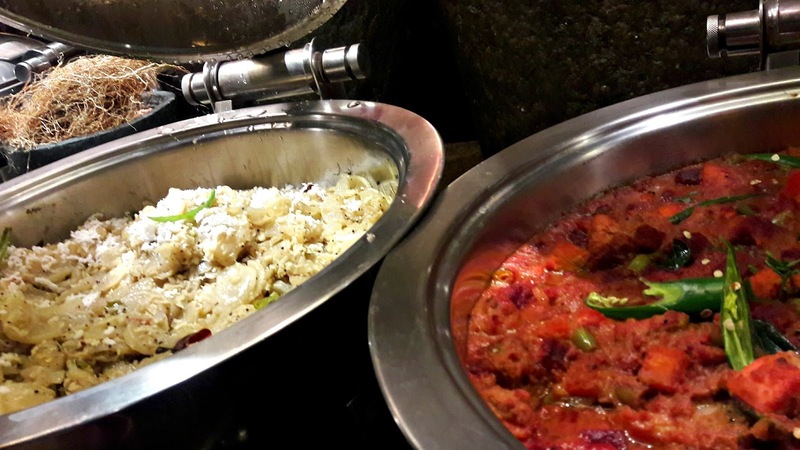 It is priced at 1450/++ per head (vegetarian) and 1650/++ (non-vegetarian).